Bring healthy living to your dog with the best quality of “Dog Running Machine” which created and designed from the highest innovation and technology in machine. A machine is a quality and durable materials manufactured with long working time. Because of an efficiency of the Dog Running Machine that is capable to receive the dog’s weight. Your dog will be strong with healthy by an exercise. “Dog Running Machine” a new selection for all dog lover! 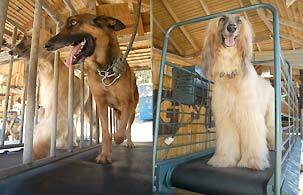 This exercise machine designed for suitable to every dog species… to healthy dog. Motor 1 HP, 220 V.
Speed adjustable 1-10 Km./ Hr. * Available for Wholesale Price.